Creative tourism is becoming increasingly popular, benefiting both travelers and their travel destinations. The official definition of creative tourism was formulated in 2000 by professors Crispin Raymond and Greg Richards: ‘‘Tourism which offers visitors the opportunity to develop their creative potential through active participation in courses and learning experiences, which are characteristic of the holiday destination where they are taken.” In other words, during your travels, you can either try a completely new activity or seek out locations in which you can enjoy your hobbies within foreign lands. The creative tourism options are endless and include language courses, arts and craft workshops, wine making or cooking classes, yoga and meditation trainings, photography lectures, fashion and design workshops and dance lessons to name a few. The idea of creative tourism is to participate in learning experiences that are related to local culture and traditions. In many destinations worldwide, creative tourism is starting to replace traditional tourism. More tourists are seeking not only to travel to see new places, but also to actually experience and immerse themselves in the local culture. Actively participating in various practices and meeting with local people, provides tourists with a deeper connection and understanding of the culture. To this end, creative tourism allows for people to cease being simply a tourist and instead become at one with the locals. Creative tourism can open your mind, eliminate cultural barriers and prejudices as well as change the way you see the world. Ultimately, it can transform you from a world traveler to a world citizen. By immersing yourself in local culture and taking part in regional traditions, you instantly enhance your travel experience and discover a far more meaningful and joyful connection to the places you visit. Additionally, by acquiring different skills and learning something new, you increase your own level of creativity and consequently feel more fulfilled. Creative tourism is not just a week away from home to recharge your batteries - it is an experience that you will never forget. You find that you have used your time productively, and the acquired knowledge and skills will remain with you even after your vacation is over. Creative tourism can also be the best way to invest in your personal growth. It gives you a chance to dive into local culture, to express yourself through creativity and even to discover your true identity. While mass tourism very often brings a lot of harm to tourist destinations, creative tourism is more sustainable, and it also plays an important role in the development of local culture. Due to the growing desire from travelers seeking out creative tourism, many touristic destinations in several countries have now proclaimed themselves ‘creative’ by joining the Creative Tourism Network®, an international organization that promotes creative tourism all over the world. Creative tourism now provides new life to many of the lesser known destinations that were previously almost non-existent on the tourism scene. Nowadays, these new destinations are starting to attract creative travelers who are interested in the local culture and that are seeking for something more profound than just an eat-shop-party kind of holiday. Creative tourists travel all year round, stay in destinations longer, care more about the environment and interact with locals on a deeper level. In turn, they have far more positive impact on the local culture and economy. As this blog is dedicated to Rio, let me present you my best experiences of creative tourism in the Marvelous City. Besides being the best physical training in Rio, Afro-Brazilian dance also has a very interesting history. The roots of dance of orixás (dance of gods) extend all the way to Africa. In Brazil, this form of dance is an integral part of candomblé and umbanda religions, whereby practitioners honor their deities (orixás) by dancing, playing music and singing. Today, dance of the orixás is a popular activity for many Brazilians as well as foreigners, regardless of their religious beliefs. In a class, you will learn the basic orixás’ movements that represent their character traits, deeds and personal stories. The class is accompanied by live drum music with a different rhythm for each god. After each class, the teacher gathers all the students into a circle and talks about topics that people don’t bring up very often nowadays. She stresses the importance of human values, of sharing positive energy, of respect for older people and of inner strength when facing difficulties. She and her followers fight against social injustices through dancing, worshiping their orixás and spreading the word of equality. They defend the rights of Afro-Brazilians, women, homosexuals and others who are still being oppressed in the modern Brazilian society. When you find yourself in this melting pot of different ethnicities, cultures and beliefs, all dancing together, you are surely no longer just a tourist - you now know and understand Brazil even better than many native Brazilians do. In addition to improved language skills, a Portuguese course gives you a great overview of the local society, politics and culture. You get to know many interesting facts that you would never be aware of otherwise, unless you follow several local press editions and TV programs regularly. The information is presented in such an easy and fun way. For example, you learn about Brazilian music by singing, politics by debating with your classmates and history by watching exciting movies. Additionally, each evening after class, you can continue practicing your Portuguese by participating in some of the sport or cultural activities that are organized by the school. There is always something new each day of the week, such as beach volley, movie nights, samba lessons, football, capoeira classes. Once a week you are even invited to take part in a city tour or nature hike to get to know the best local attractions. Occasionally, the school throws a street party to get students from all groups and levels together – a great opportunity to get free caipirinhas, make friends and practice your fluency in Portuguese. However, the main highlight of the whole course is a favela tour that takes you to one of Rio de Janeiro’s slums. It gives an insight to the community life, its history, daily challenges and future hopes. You can also sign up as a volunteer to teach English to the ghetto’s children or participate in other social projects. All this provides you a unique chance to become a part of the Brazilian culture that traditional tourists will never get to experience. In my opinion, Brazilian artisans are among the most talented and inventive in the whole world. Their bold ideas, vivid colors, intricate details and eye-catching patterns will leave no one indifferent. Whether they reside in their own studios or just sell their art on the streets or at local markets, you will surely find some true masterpieces among their work. Brazilian ceramic art should be especially noted. Each atelier has its own unique style, and it seems that local artisans’ fantasy has no limits. However, if you are tired of following the beaten path of buying souvenirs in every place you visit, why not try and make one with your own hands. 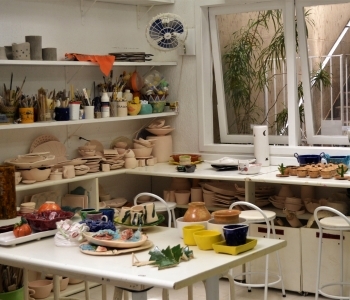 In a pottery class, you will be surprised to find out that you can create something awesome within your first two workshops. The teacher provides you some suggestions, but you decide what piece you would like to make. During the first lesson, you learn basic clay hand building techniques. By the next lesson, your piece is already dry, and you will then start with glazing. 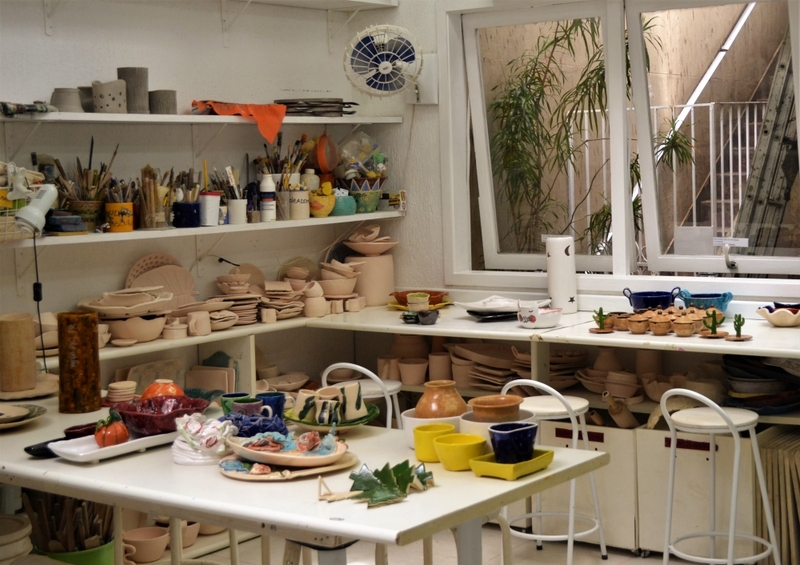 Lastly, the ceramics are set and you can then collect your first work of art. Even if you are not that fluent in Portuguese, you will understand the main techniques just by observing what others do. There are uncountable opportunities for creative tourism in Rio de Janeiro, as well as in many other destinations worldwide. If you are not a creative tourist yet, maybe it’s time to explore the possibilities out there and become part of the creative scene!